Here’s a look at what the contraption I’ve stacked together looks like. 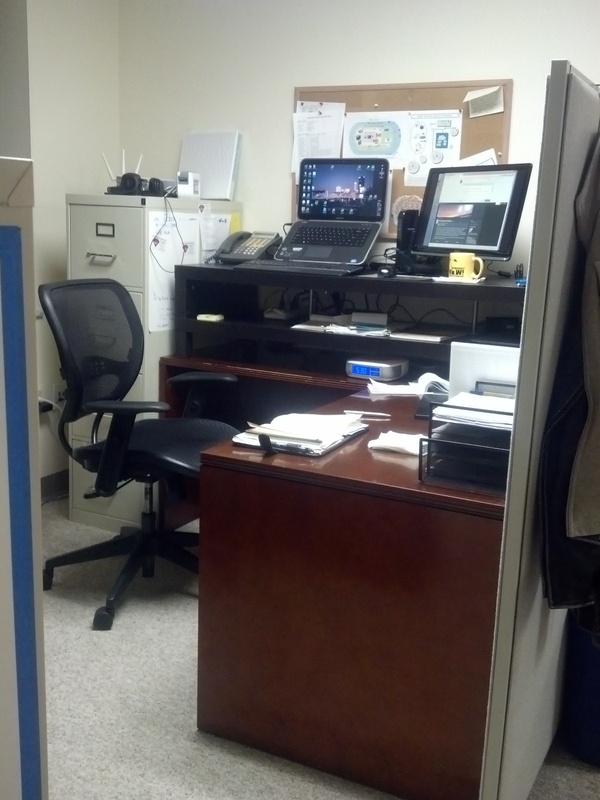 Notice the 14″ high broad TV stand placed on a regular office desk. Part of the problem with my cheap solution versus a $2000 desk made for standing is that there is no way to adjust the apparatus down to sitting level. So I decided to categorize my typical work into sitting and standing operations. This has added the benefit of scheduled variety into my day, which is also a productivity hack touted by many. So when I’m standing, I’m attending to network tasks, email and online meetings, while I use my sitting time for computer bench-work, calendar and to-do maintenance, news feed reading, and blog posting or drafts. Granted this has meant using an old laptop or tablet often while sitting, but as the PC fix-it guy, those tools are relatively abundant. So if you are interested in burning a few calories and adding a curve-ball to your productivity, I’d recommend looking into these standing desk links I’ve found. Maybe trolling your local Craigslist site for some old furniture would make it an easy experiment for you as well. Be prepared to find a footstool and perhaps plan on more comfortable shoes. Once the spark from the new technique wears off, you may find your feet and legs reminding you why they developed cushy office chairs.